Introducing our new Internet of Things Kit! 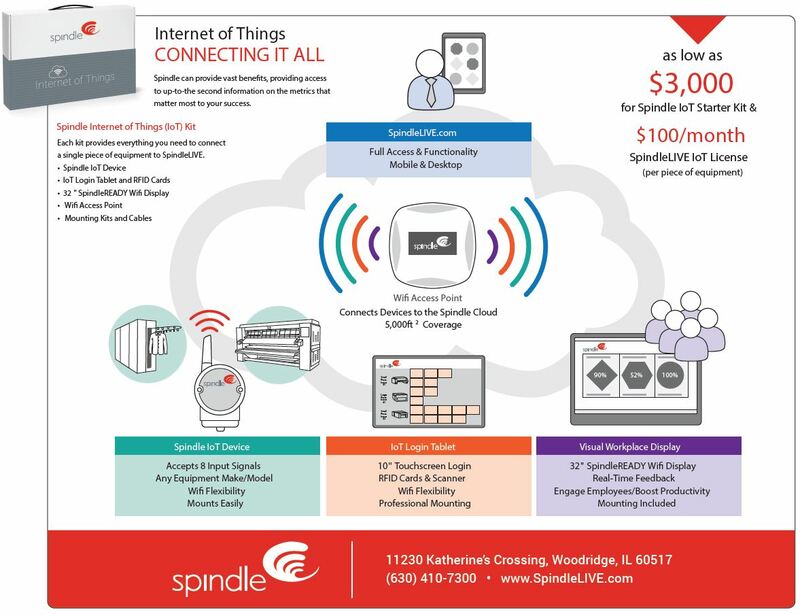 Introducing Spindle's NEW Internet of Things Kit! In today’s smart factories, machinery and computer systems carry out complex tasks, exchanging information and instructing each other without the need for human involvement. Industry 4.0 relies heavily on the growing Internet of Things (IoT)– equipment and other devices embedded with technology that can communicate with IT systems and be sensor-detected. Cloud computing technology supports these millions of sensors and devices, managing the storage and flow of information they create. Spindle now offers an ideal way for businesses to take their first steps into implementing a visual workplace for critical critical IoT technologies. Introducing Spindle IoT – Connecting It All. Containing everything you need to connect a single piece of equipment to the cloud, this Spindle entry point gets you started at an affordable price... allowing staff to start receiving information from this equipment in real time with full access to SpindleLIVE. Whether your organization is a dry cleaner, on – premise laundry (OPL) or a larger laundry needing the benefit of real time data on specific equipment – get started with our Spindle IoT kit offering automation as low as $2500 with $100 per month subscription. Want to receive the latest news and product updates for Spindle? Visit our Knowledge Center and Subscribe!